Gregg Allman with big brother Duane in the background, on tour in 1971. Duane died in a motorcycle accident in October, ’71. Every Friday night during the fall of ’69, my very first semester at Penn State, I walked home from class to my East Halls dormitory (I remember the walk across campus getting darker and darker as the semester progressed), scattered some books on my desk and eagerly walked down the hallway to a room where the music was already blasting. I entered the room and kneeled down to re-position a towel that was stuck between the lower door jamb and the floor…a feeble attempt to prevent marijuana smoke from revealing itself to hallway passers-by. The room was dark except for a flickering strobe light and the occasional match or lighter firing up a water pipe or other such illicit implements. I had some catching up to do. The album on the turntable was presented to us by our friend from Florida, John S., an odd lot since most Penn Staters come from Pennsylvania for obvious reasons. John raved about this new band from his neck of the woods. And he was right: This Allman Brothers Band was like nothing we had ever heard. They played blues standards with steely high energy, a pleasing melodic flair, a superb use of rhythmic devices (like the bass-driven swirling pulse of “Whipping Post” or the syncopated rhythm of “Black-Hearted Woman”) and just great musicianship that included two drums and two lead guitars. After a few tokes, I was playing air guitar with the rest of them. So What is this Southern Rock? Many of rock ‘n’ roll’s early pioneers were from the South. Little Richard, Jerry Lee Lewis, Bo Diddley, Fats Domino and the King of Rock ‘n’ Roll himself, Elvis Presley, all hailed from there. During the rock explosion of the late ’60s and early ’70s came North Carolina’s Charlie Daniels, singing his novelty songs about the South. There were Little Feat, Black Oak Arkansas, ZZ Top, Marshall Tucker Band, the Outlaws, the Ozark Mountain Daredevils and especially Lynyrd Skynyrd. 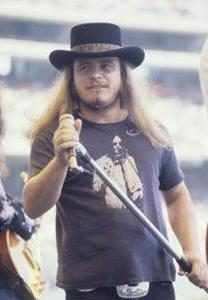 Lynyrd Skynyrd’s singer and songwriter Ronnie Van Zant, who also died tragically. There were some significant parallel lines between the Allman Brothers Band and Lynyrd Skynyrd. 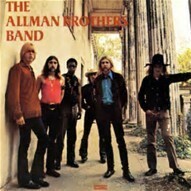 Members of both bands came from Florida, though the Allmans settled in Georgia while Skynyrd found peace in Sweet Home Alabama (just ask Neil Young). Both bands made liberal use of the slide guitar, with Duane Allman finding his chops playing for the great Wilson Pickett (that’s Duane’s slide on “Hey Jude”) while Gary Rossington was part of a dynamic guitar duo for Lynyrd Skynyrd. Gregg with Duane Allman and bassist Berry Oakley. The latter two died almost a year apart on a motorcycle. Tragedy struck both bands with equal cruelty. 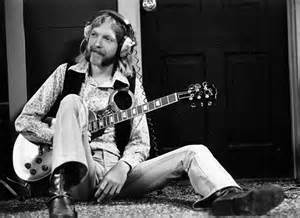 On October 29, 1971, Duane Allman dumped his bike trying to a avoid a flatbed truck and died in a hospital. On November 11, 1972, an inebriated Berry Oakley rammed his motorcycle into the side of a bus just three blocks from where Duane crashed. Lynyrd Skynyrd’s fate was sealed on October 20, 1977, when a chartered aircraft carrying Ronnie Van Zant, Steve Gaines and Cassie Gaines went down somewhere over Mississippi, destined for a gig in Baton Rouge, Louisiana. Unlike the Allman Brothers, Skynyrd never got back together. Rest in peace, Gregg Allman, December 8, 1947 – May 27, 2017. 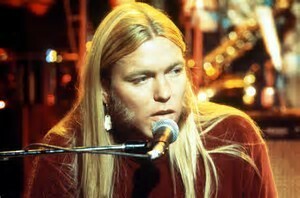 Now that Gregg Allman has passed, we can admire his band’s achievements: Rock and Roll Hall of Fame in 1995. Rolling Stone ranking them 52nd of their 100 Greatest Artists of All-Time. Let’s go back to that first album that so thrilled me in that smoke-filled dormitory room. Before the recording session that reportedly lasted a scant two weeks in August, 1969 in New York City (Allmans biographer Alan Paul said, “virtually no outtakes exist from the sessions”), Duane Allman had completed a residency at the famed recording mecca in Muscle Shoals, Alabama. The guitarist rubbed shoulders with Aretha Franklin, King Curtis and the aforementioned Wilson Pickett, steeping himself in African-American music. When Duane headed back to Florida, he brought with him drummer Jai Johnny “Jaimoe” Johanson, drummer Butch Trucks and bassist Berry Oakley. Guitarist Dickey Betts had played with Oakley in a band called The Second Coming and came on board. The song came to him shortly before bed but he was unable to acquire a pencil and paper to write down his ideas, as there was a child asleep in the room and he could not turn on the lights. Turning to his next best alternative, he struck two kitchen matches (one for light and one, later blown out, as a charcoal writing utensil) and wrote down the lyrics on a bedside ironing board. That is one determined musician.